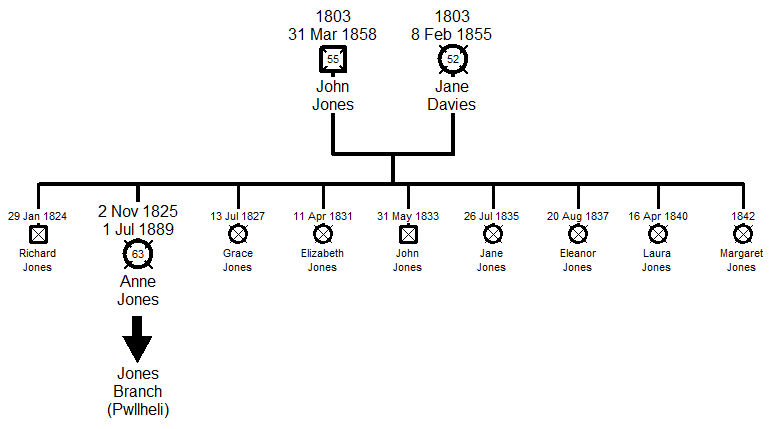 Please note: Anne Jones was the daughter of a John Jones who was a nailer in Pwllheli, therefore it is assumed that Anne was the daughter of John Jones the nailer detailed below. It is also assumed that the Anne Jones baptised in Llanystumdwy is the correct Anne. John Jones was born circa 1803 in Llandwrog, Caernarvonshie. He married Jane Davies, and in 1824 their eldest child Richard was baptised in Pwllheli, Caernarvonshire. On 2 November 1825 their next child Anne was baptised in nearby Llanystumdwy, Caernarvonshire. The rest of their children were baptised between 1827 and 1842 in Pwllheli. John Jones was a nailer and at the time of the 1841 census, the family was living at Penrhydlyniog, Denio, Pwllheli; and in 1851 in Penlan Street, Pwllheli. Jane died in Customs House Square, Pwllheli on 12 February 1855 aged 52 and John died in Customs House Square, Pwllheli on 2 April 1855 aged 56. Anne Jones was baptised in Llanystumdwy, Caernarvonshire on 2 November 1825. On 13 August 1847, she married William Jones a tailor from Pwllheli. William and Anne then lived at Penrhydlyniog, Denio, Pwllheli. William seemed to start and finish his career as a tailor, but spent some time in-between as a fisherman. In 1861 they were living in Penlan Street, Pwllheli and in 1871 in Gadlys, which is also in Pwllheli. This was where Robert Jones, their youngest child was born on 22 March 1873. I would like to thank David Wyn Roberts for providing the information about John Jones and his family.